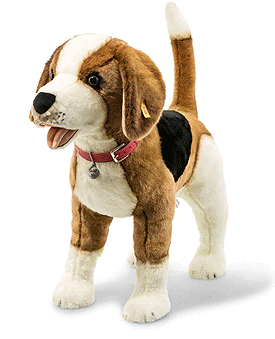 Nelly The Beagle by Steiff is from the Steiff Classic collection and made in beautiful brown, black and white soft plush. Margarete Steiff GmbH and Jasmin Khezri, inventor of the well-known fashion and lifestyle figure IRMA, present “Nelly the Beagle”. Nelly is IRMA’s pet beagle. In the fashion world, IRMA is the alter ego of artist and author Jasmin Khezri and a unique lifestyle character. Jasmin Khezri herself has a pet beagle who was the inspiration for “Nelly the Beagle”. Nelly frequently accompanies IRMA on her travels and is now a permanent fixture in her life.